Yes!!! It’s that time of the year again! Who doesn’t love the Baby Time Show – Now called Baby & Toddler Show?! If you missed last year, you definitely don’t want to miss this time around. THAT’S IT!!! We will be announcing the winner Friday, April 19!!! Make sure you enter before then!! Don’t worry if you don’t win, we are also giving all our readers a promo code! For over 20 years, The Babytime Show has been the place to go for parents who want to stay in the know! 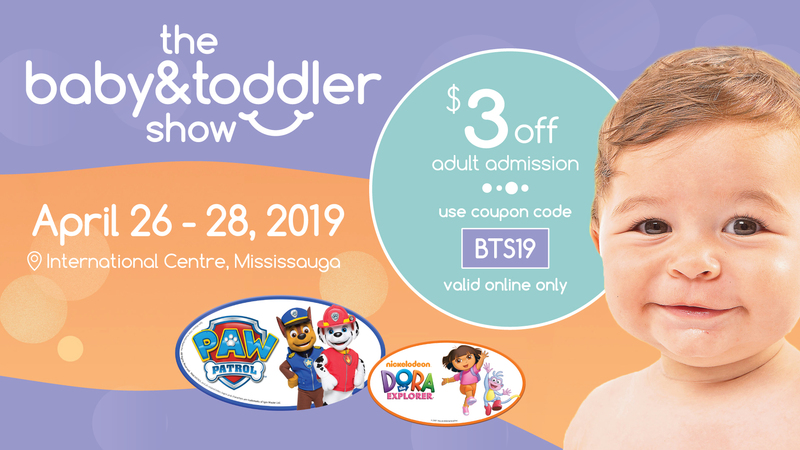 Now called The Baby & Toddler Show, this popular show is a must attend for anyone expecting, just delivered, or in the midst of managing the schedule of a little one. From Friday, April 26 to Sunday, April 28 Toronto’s original baby show is back at The International Centre, Hall 1. From major brands and unique artisans to a stellar guest speaker and top-notch toddler entertainment, The Baby & Toddler Show will delight audiences of all ages. This year’s show features Dr. Robert Titzer on the Main Stage. Dr. Titzer is a published expert in the area of infant learning. Titzer has given talks about early learning on five continents, speaking with tens of thousands of parents around the world. Come see him demonstrate fun learning activities that caregivers can do with infants and toddlers to stimulate brain development. These activities will give your little ones the best start in life and the skills to succeed in their later years. Joe Fresh will be on onsite to showcase Joe Fresh Sprout, their adorable newborn collection. Available in size 0-12 months, the collection includes cozy mix and match bodysuits, footed sleepers, soft and snuggly beanbags, multipack sets and much more. They will also have apparel for 0-24 months available for purchase. Rascal + Friends brings their well-known brand from New Zealand to Canada, only at the show. They will be offering free samples in sizes 1-6 (6lbs – 35+lbs) and offering show specials on their packages of diapers. Mondo Choice Baby Diapers joins us as sponsor of the Diaper Derby with their premium diapers made with sustainably harvested pulp, plant-based materials and naturally derived odour. No fragrance, lotions or latex will appeal to the most discriminating parents. Marlene’s Just Babies is featuring the latest from UPPA baby, including the latest 2019 colours. For those with toddlers in tow, the show has a line-up of kiddie approved entertainment. Toddlers will delight in meeting their TV heros, starting with Dora the Explorer and Boots at the front doors. Then they can get up and moving with “ALVINNN!!! and the Chipmunks”. And to top off their day, toddler favourites Chase and Marshall from Paw Patrol will be in the Meet & Greet area daily. Head to www.thebabyandtoddlershow.ca for all the show details, and buy your tickets at https://thebabyandtoddlerspringshow.tix123.com/. Come learn all about having the best pregnancy ever, try out popular brands, find exciting new products, be surrounded by other new and soon-to-be parents, entertain your toddler, and get ready for the parenting ride at The Baby & Toddler Show!